It’s no surprise that businesses have a “me-problem.” They tend to build systems and infrastructures that make life easier for those that work at the company rather than those who do business with the company. That means that it’s a war of me: the me of those inside the walls and the me of those customers outside the walls. 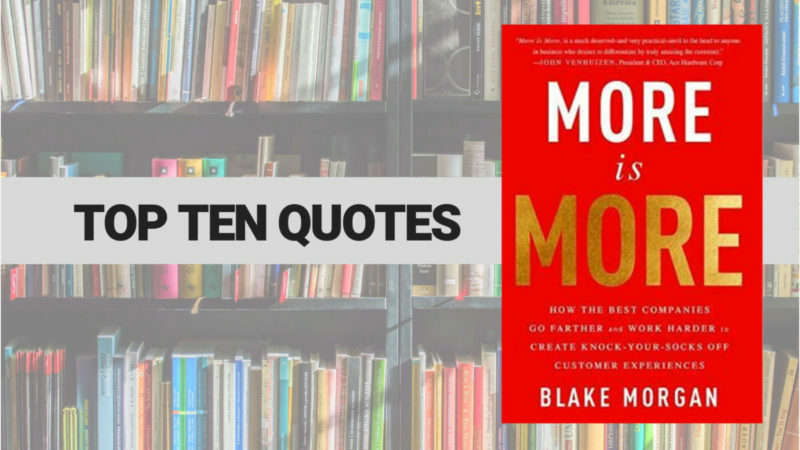 Blake Morgan tackles this idea in More is More: How the Best Companies Go Farther and Work Harder to Create Knock-Your-Socks-Off Customer Experiences. If you’re even a relative newbie on this blog, you know that I believe the church can pick up really strong, transferable ideas from businesses on how we can treat people better. Still, don’t let the business nature of this book freak you out. Sub in “churches” for “companies,” “guests” for “customers,” and understand that for us in church world, there’s much, much more at stake than a healthy bottom line or improved CX scores. The companies that embrace a “more is more” philosophy work harder and go further to ensure that their customers have a positive experience. …organizations are terrified to slow down and be thoughtful. Listening is hard. It requires an individual to focus and control her urge to talk over the other person. 32 percent of consumers expect a response within thirty minutes when they engage through social media channels. …not every problem unfolds in accordance with a script. Customers would rather fix problems themselves than contact your brand. Simply put, you need to be easy to do business with. Customer experience does not equal customer service. In any line of work, if you care about quality, you work very hard to make your offerings and processes seem effortless.